London Green Left Blog: YouGov Poll - 'Lady Jane' May – Modern Day Queen for 9 months? YouGov Poll - 'Lady Jane' May – Modern Day Queen for 9 months? 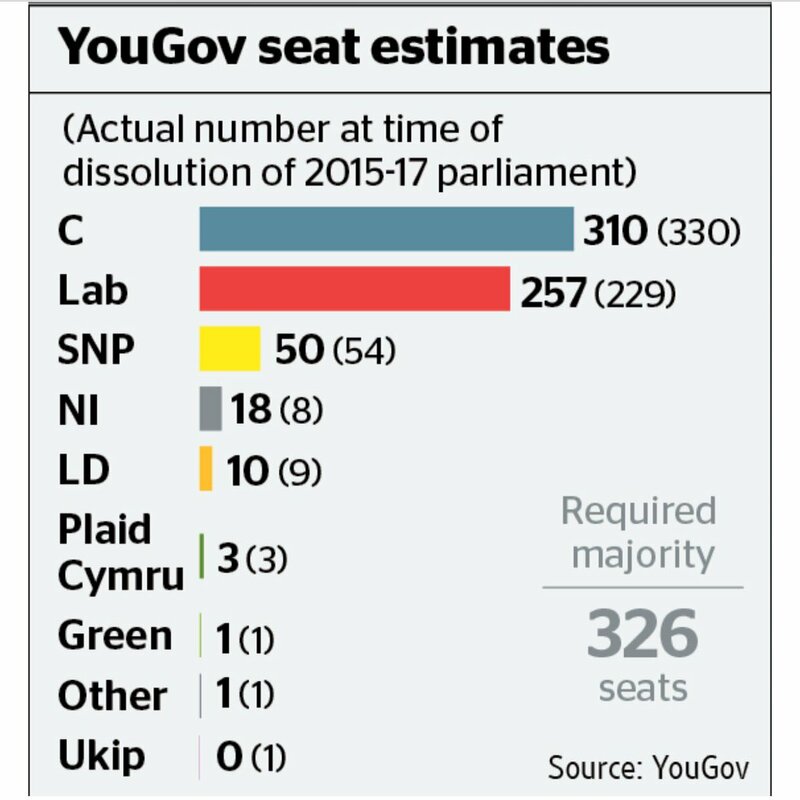 YouGov’s latest general election forecast for the Times, of how many seats in Parliament each party will win at the general election next week has caused panic in the Tory Party. 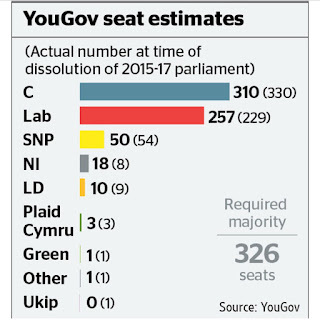 The Tories may lose their overall majority, and a hung Parliament would be the result on 8 June, according to YouGov. There is a health warning with this poll from the pollster themselves, saying alternatively the Tories could gain an extra 15 seats. This poll is of course also open doubt anyway, given the recent inaccuracy of the polling industry generally. Whilst the media report much scepticism from Labour MPs about this poll, Tory MPs are apparently plotting away, in an attempt to find one candidate to replace Theresa May as leader, should all of this come to pass. We know from experience just how ruthless the Tories are with leaders they perceive as losers, and even though the Tories would be the largest party on these calculations, there is no doubt it would finish off Theresa May as Prime Minister and Tory Party leader. Remember, there was no real need for this election to be called in the first place, with three years to run of the Parliament, and with the Tories holding a small, but workable majority in the House of Commons. May claimed that she needed to call the election because the opposition parties, were err opposing her, on the terms of Brexit. It was a clear piece of political opportunism on May’s behalf, an attempted power grab, whilst the opposition was in some disarray. May has also made this election a very personal one, one where the choice of the country’s leader is down to her or the Labour leader, Jeremy Corbyn, who she says is unelectable. The whole focus of the Tory campaign was to be her, and her leadership qualities, but this started to unravel almost immediately, with public perceptions becoming increasingly negative. The refusal to face Corbyn in a televised debate, the hiding away in remote locations where speeches were delivered to groups of Tory loyalists, all started to chip away at the favourable view of May the public had at the start of the campaign. The wider campaign itself, has been by far the worst Tory Party general election campaign I can remember, which culminated in the disastrous policy U-Turn on social care, quickly dubbed the ‘dementia tax,’ and compounded by withdrawing winter fuel allowance from most pensioners and removing the ‘triple lock’ on pension increases, which would lead to lower pension rises in future. From this moment on, the campaign came alive as real contest. The limited opportunities for the public and journalists to question May, that finally came have not gone well at all, with May looking awkward and robotic under questioning, which has further reduced her standing, it appears. Some commentators are saying this poll will play to the Tories advantage, as Tory intending voters will now not be so complacent about turning out to cast their ballots. There could be some truth in this, and we will hear a lot about the infamous ‘coalition of chaos’ that the Tories say would be case if the result turns out like this YouGov forecast. This worked well for Tories in 2015, with scaremongering about the SNP forcing policies on the English, and may well do so again. Or it could be that voters don’t want May to have a big majority and therefore force through whatever she deems to be in Britain’s interest. At least a coalition, even an informal one would have the advantage of speaking for different parts of the country and for supporters of different parties. We will have to wait and see which view prevails, but one thing is for sure, even if the Tories manage a small majority again, May’s credibility will be shot. And anything worst than the Tories 12 seat majority from 2015, will spell the end for May as Prime Minister. Good riddance, I say, to this untalented megalomaniac. I’ll leave you with Captain Ska’s ‘She’s a Liar, Liar,’ which has just reached number one in the music download charts.